The most fascinating little contest in tabletop RPGs returns for another year. For the past five years, a collection of professional and amateur tabletop RPG designers have been getting together to build a collection of miniature RPG adventures called One Page Dungeons, called such because they literally fit on a single page of standard notebook or A4 paper. Everyone is free to enter, and it doesn't take fantastic graphic design skills to take the trophy. In fact, amateur entries are encouraged. The judges haven't yet been announced, but creativity is king in this contest. The rewards for victory range from a variety of free game books to a $500 prize. The deadline for submission is April 30th, 2014. Maybe the best thing about the contest is that you can get free copies of the adventures once the thing is over. Archives of past winners are freely available and RPG system agnostic, so you'll probably be able to find something quite useful for whatever system you favor. 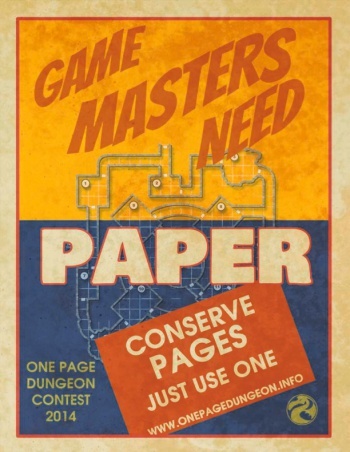 You can check out the official rules and enter at the One Page Dungeon site.